6 FT.. 3" TALL! 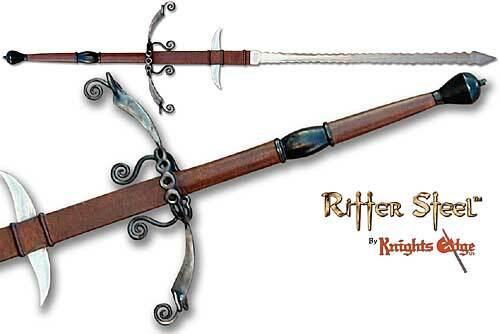 ... that's an incredible 75" and so "Authentic" this German medieval sword rivals the ones found in museums. It is a must for the serious weapons connoisseur, and will become the treasured centerpiece in their collection. Remember, this handmade Flamberge sword is not for the faint of heart...as Great Landsknecht Swords were wielded by only the strongest and most fearless chosen front line Swiss and German soldiers of the Middle Ages. Its main purpose was to down charging horsemen and cut off oncoming pike heads. Wrought iron and steel has been worked to duplicate the design of an original piece now in private collection. A wonderful sword I have used to train with for almost 14 years come Christmas 2017. Highly recommended for strength training and learning to use your body with proper footing. Thank you KnightsEdge for having such a weapon available! Just arrived and this sword is AWESOME!!!!! !